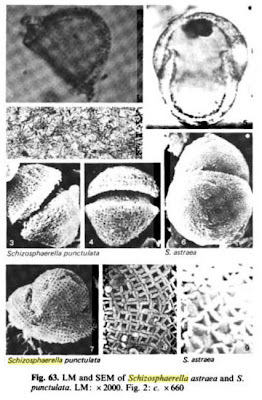 Micrographs of Schizosphaerella from Perch-Nielsen (1989). The dead are all around us. Large parts of the world's surface are made up by the remains of long-gone marine organisms who left their shells and skeletons, initially constructed for protection from predators and the elements, to form gigantic sedimentary graveyards. Over time, as with everything else, the identities of these unwitting benefactors have changed as new groups supplant the old. During the Jurassic period, the predominant groups of biomineralising plankton were the calcareous coccoliths and Schizosphaerella (radiolarians were present but only important under certain conditions, planktic foraminiferans would not appear until the Cretaceous, while diatoms appeared in the Jurassic but remained marginalised until during the Cenozoic - Erba, 2004). Of these two, Schizosphaerella was particularly significant; at times, it accounted for nearly 100% of plankton-derived carbonate deposition (Mailliot et al., 2007). Schizosphaerella left its remains from the late Triassic to the end of the Jurassic in the form of globular to bell-shaped resting cysts, five to 30 μm in diameter, known as schizospheres. These are composed of two roughly hemispherical plates joined by a simple hinge. The two recognised species, S. punctulata and S. astraea, are distinguished by the presence or absence, respectively, of a subperipheral groove around the hinge and by the lattice arrangement of the elongate radiating elements that make up the wall (Perch-Nielsen, 1989). The nature of the Schizosphaerella organism during the active parts of its life cycle (assuming that the fossils are cysts) are unknown, as are its relationships to other organisms. The most common suggestion is that it represents some form of dinoflagellate - calcareous cysts are definitely produced by dinoflagellates of the subfamily Calciodinelloideae. However, Streng et al. (2004) have pointed out that the two-plated hinge arrangement of Schizosphaerella is unlike that known for any dinoflagellate, whose cysts normally open through an archeopyle at one end. That micropalaeontology is littered with examples of taxa of uncertain relationships (becoming more so the further back one goes in time) should come as no surprise to anyone - after all, it is often difficult enough to work out the relationships of modern unicellular organisms on morphological grounds, and doing so is often dependent on features of cell ultrastructure that are unlikely to be preserved in fossils. Mention should also be made of the nannofossil Stomiosphaera minutissima which was described as having a calcareous cell wall of two layers - a thin inner layer and an outer layer composed of radiating fibres. 'Stomiosphaera' was shown by Aubry et al. (1988) to be the same as Schizosphaerella, but diagenetically altered (diagenesis is the process by which the nature of a fossil can be altered by geological processes after it gets deposited). The inner layer represented the two plates of the original fossil fused together while the outer layer resulted from crystal formation around the fossil. 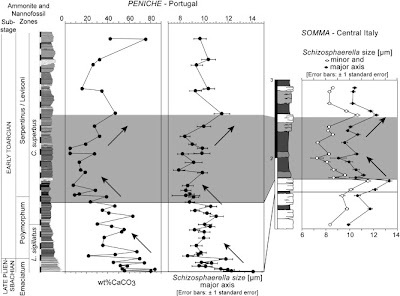 Mean Schizosphaerella size over time compared to levels of carbonate production, from Mattioli et al. (2009). Schizosphaerella seems to have preferred oligotrophic conditions with a deep nutricline (i.e. nutrients in the sea were spread out rather than being concentrated near the surface). An inverse relationship existed between Schizosphaerella and coccolith abundance (Cobianchi & Picotti, 2001) that was also related to the concentration of organic carbon in the water - high organic carbon (i.e. eutrophic conditions) meant more coccoliths and fewer schizospheres, low organic carbon the reverse. Periods of schizosphere abundance also relate to higher sea levels as reduced land level meant reduced organic run-off into the oceans. Both calcareous groups, however, showed reductions during periods of elevated CO2 levels that punctuated the Mesozoic. The Toarcian anoxic event in the early Jurassic seems to have resulted from extensive vulcanism in southern Africa; the mean size of schizospheres becomes much smaller during this period as calcification became reduced by higher ocean acidity (Mattioli et al., 2009). This reduction in calcification is correlated with the extinction of a number of other organisms. Study of such past events is the best means available to us of understanding the effects that elevated carbon dioxide levels could potentially have in our own time (see, palaeontology can be practical too!). Aubry, M.-P., F. Depêche & T. Dufour. 1988. Stomiosphaera minutissima (Colom, 1935) from the Lias of Mallorca (Balearic Islands) and Umbria (Italy), and Schizosphaerella punctulata Deflandre & Dangeard, 1938: taxonomic revision. Geobios 21 (6): 709-727. Cobianchi, M., & V. Picotti. 2001. Sedimentary and biological response to sea-level and palaeoceanographic changes of a Lower–Middle Jurassic Tethyan platform margin (Southern Alps, Italy). Palaeogeography, Palaeoclimatology, Palaeoecology 169 (3-4): 219-244. Erba, E. 2004. Calcareous nannofossils and Mesozoic oceanic anoxic events. Marine Micropaleontology 52: 85-106. Mailliot, S., S. Elmi, E. Mattioli & B. Pittet. 2007. Calcareous nannofossil assemblages across the Pliensbachian/Toarcian boundary at the Peniche section (Ponta do Trovão, Lusitanian Basin). Ciencias da Terra (UNL) 16: 1-13. Mattioli, E., B. Pittet, L. Petitpierre & S. Mailliot. 2009. Dramatic decrease of pelagic carbonate production by nannoplankton across the Early Toarcian anoxic event (T-OAE). Global and Planetary Change 65 (3-4): 134-145. Perch-Nielsen, K. 1989. Mesozoic calcareous nannofossils. In Plankton Stratigraphy vol. 1. Planktic foraminifera, calcareous nannofossils and calpionellids (H. M. Bolli, J. B. Saunders & K. Perch-Nielsen, eds) pp. 329-426. Cambridge University Press. Streng, M., T. Hildebrand-Habel & H. Willems. 2004. A proposed classification of archeopyle types in calcareous dinoflagellate cysts. Journal of Paleontology 78 (3): 456-483. Hold it.... There were only TWO species in the whole Mesozoic? Either these guys were truly remarkable in their stasis, or the micropaleontologists who work on them use a remarkably silly species concept. Not really either, probably. It's simply that there are very few morphological features involved, so even if there were large amounts of genetic evolutionary change going it, it didn't leave any trace that we can reliably distinguish in the fossil record. Molecular studies on some modern protists have shown that some single "species" encompass individuals whose level of genetic distinction suggests divergence tens of millions, if not hundreds of millions of years ago. But again, because their morphology is so simple, there aren't any reliably distinct morphological characters to distinguish the lineages. Nice to see someone who likes Schizosphaerella, it really can be very abundant, and is one of the first major biocalcifying plankton. Also it's wall structure is amazing, have a look at Kalin (1980 Eclog Geol Helv. 73 983-1008). Re Gunnar's comment micropalaeontologists certainly have looked to see if there is any significant variation in Schizospharella not least since any increase in our ability to use these fossils for dating rocks is very useful. However, they really do not change much in size and shape. The wall ultrastructure is less well-known as you need SEM to really see it but again there is not much sign of variation through the Jurassic (they do not occur through the whole Mesozoic). As nannofossils go Schizosphaerella is an unusual example of stasis, but not unique. NB The Perch-Nielsen reference should be 1985 not 1989.